A study into music downloads has suggested that Ed Sheeran is the UK's most pirated artist, with Drake topping the US piracy charts. Research into BitTorrent data, published by Musicmetric and seen by the BBC, suggests that over 40 million albums and single were shared in the UK, in second place to the US with 96.6m downloads. 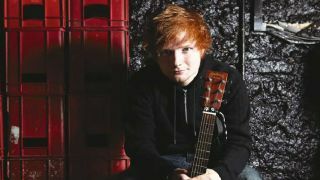 Rihanna was the most pirated artist globally, with more than 1.2million downloads of her latest album Talk That Talk, and Sheeran topped a UK list. But not all of the data makes a lot of sense; apparently Louis Armstrong is the most illegally downloaded artist on the Isle of Wight – which, let's face it, seems a little off. Sheeran interviewed about the data by the BBC was fascinatingly pragmatic about the whole thing, suggesting that his popularity both legal and illegal contribute to the number of live gig tickets he sells – and makes more out of. The record labels, however, are unlikely to be in agreement with the star, as they lose out on huge sums because of illegal downloads and have lobbied for much of the current legislation. "A lot of people are getting very rich from stealing other people's things," said Geoff Taylor, chief executive of the BPI. "That's wrong, and we think that musicians deserve to be paid for what they do, just like everyone else."